Some pastors of more traditional churches consider Web and parachurch ministries (especially creation science ministries) to be unimportant, or even harmful. There are people who consider these ministries extremely helpful, and feel no need to attend a church. Is there a balance between the two views? Yes. The traditional concept of "going to a church building" is not exactly biblical. There is no concept of attending First Church morning for Sunday School, the main service, and Wednesday night prayer meeting (with the occasional potluck supper). The early church met in homes, catacombs, or wherever they could, especially during times of persecution (like many church groups in atheist-run or Mohammedan-run countries). 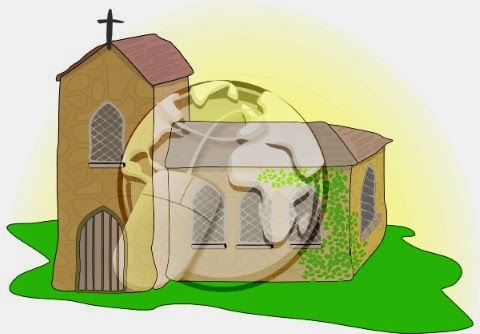 However, free societies have church buildings and regular meeting times. Although not supported by Scripture, there is nothing essentially wrong with that long-standing concept, either. Likewise, there is no biblical support for parachurch ministries, but no prohibition against them. Some mainstream churches resent parachurch ministries (whether on the Web or elsewhere) because they feel that people's loyalties are divided. (I heard someone who had a parachurch ministry express dislike for the word "parachurch" because it sounded too much like "parasite".) Another concern that churches have about outside organizations is that many (if not most) are fully independent, and have no accountability to a church. Some churches are doing what they're supposed to do: Minister to the saints through teaching sound doctrine, meeting their physical, emotional, and spiritual needs, sharing the gospel message to the lost, and other concerns. Overall, mainstream churches are failing. Part of the reason is that they seem to be more like religious social clubs than actually ministries. Many are perceived as being interested more in money than people, and that adds fuel to the resentment fire of those churches toward outside ministries. Of course, it is easy to find parachurch groups that do act like parasites, preaching lame or even false doctrines, emphasizing how you need to give them money (often through misquoting Scripture and "guaranteeing" financial blessings if you pay up), and other matters of dishonesty. Some of those teaching false, liberal, and feel good doctrines are doing rather well, even financially. If mainstream churches had been doing their jobs by teaching sound doctrine (including discernment), and if many people weren't intellectually and spiritually lazy, perhaps people wouldn't be falling for religious-oriented scams. But no church can teach every area. Web organizations and ministries often focus on specific areas. I have an online creation science ministry where I write some original articles, and also direct people to other biblical creation science ministries. There are ministries that specialize in eschatology (there are many views), cults and heresies, specific cults, false teachings, apologetics, doctrinal questions, basic biblical teachings, and much more. I have learned a great deal from podcasts and articles from parachurch ministries, some of which I support financially. Unfortunately, there are churches who not only resent parachurch ministries (often from a loss of revenue standpoint), but also see them as unimportant. This may come from personal experience ("I don't have people asking me about creation science and evolution, or challenging me to give evidence for my faith") as well as personal biases. In the issue of origins, a pastor may not discuss the relevance of Genesis because he does not want to be "labeled", thinks it's unimportant, or something else. The big debate between Bill Nye and Ken Ham was seen by an estimated 15 million people online (tickets to attend the debate at the Creation Museum sold out within minutes), and this debate seems to have intensified. When (not "if") people want answers, many will saddle up and head for the Web. There are many trails to ride, and it is easy to encounter spiritual bandits who will give false or incorrect information to a seeker. Internet atheists are notoriously dishonest, often incorrectly seeming like they have reason on their side. People on the Web can be blunt, rude, and profane, saying things that they would never dare say to someone's face; it's easy for people like this to become keyboard warriors, hiding behind their anonymity. My point here is that people act differently online, and it's a different world in many ways. But also, with all the information available, there are deceivers. If a Christian is taught sound doctrine, critical thinking, and discernment in a local church as well as from good parachurch ministries, he or she is less likely to fall for deceptive tactics. The same criteria apply to a Christian in a false brick and mortar church, or when a cultist comes knocking at their doors. People will use the Web for information, that's the way of today's world. They cannot get all the information they want from a local church; many want it now (and usually free), no time or finances to order books at the moment. A biblically-driven local church can harness the power of the Web to help equip people for Christian living, doctrine, evangelism, and more. Although the two can appear in competition, real churches should use the Web, not shun or resent it. Also, even strapping on the feedbag with good teachings on the Web is not a valid reason to ignore gathering with believers, whether a church on a corner, rented space, home church, or something else.